If you are an entrepreneur looking to make a mark in your chosen domain, making your presence felt in the digital world is the essential factor for success. This essential condition leads to an inevitable dilemma – What should you Build- An App or A Website? Mobile websites are designed to be accessed via the smartphones and hence are adaptable to smaller screens and the touch screen interface. Apps are downloaded and installed on your mobile device rather than being accessed through the browser. The App may access data using the Internet or may download the content so that it could be used offline. 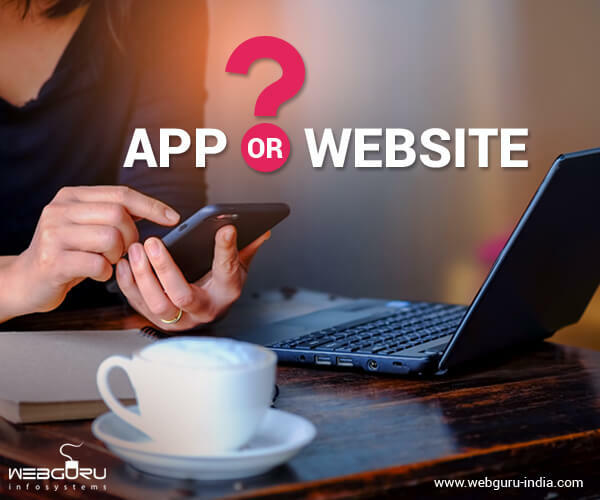 A mobile website and an app look deceptively similar and it is difficult to predict the outcome of the competition between these contrasting technologies. However, you must answer these following questions to understand which side of the war you must ally with! 1. Do You Want To Widen Your Audience? If you want to expand your user base, then a mobile website will be of better help than a mobile application. This is because a mobile website is accessible to anyone with a mobile browser across a range of devices such as iPhone, Android, Blackberry, etc. Apps, on the other hand, have to be downloaded and installed from the device specific app portals such as Apple’s iStore, Android Market or Blackberry App World so that they are compatible with the user’s operating system. This can act as a significant barrier to the initial engagement of the user and the subsequent conversion. 2. How Interactive Is Your Idea? If your idea or product is such that the user has to use it more than five times a day, then it’s a good idea to develop a mobile application in place of a mobile website. This is apparent for products like games, email, social media, notes, reminders and so on- they are played via an app because they provide a user experience through interactivity and personalization. Also, via the app, they are faster and easier to access. 3. Do You Need To Use The Native Features Of The Phone? While responsive mobile web browsers are becoming savvier when accessing the mobile specific features such as the SMS, GPS and so on, a mobile application is a step ahead in making use of your smartphone’s camera, sensors and most importantly, processing power. 4. Does Your User Need Your Product Offline? Mobile websites cannot be accessed without the internet as they source their data on a real time basis and while apps have the ability to store the user data locally on the mobile phone. Places like forests, caves, basements, and trains, etc. are places where one very often does not have access to the internet -which points towards the need to have complementary location-dependent apps such as Google Maps which allows one to download the map and use it with navigation offline! If your solution is such, that the users may require to use it under offline conditions, a mobile app is what you should be looking at. 5. How Complex Is Your Product? If your product involves complicated calculations and reports, a dedicated app is a prudent choice to make. The scrolling, editing, reviewing, calculations and re-calculations will be nightmarish using the mobile websites and easier using the optimized user interface of a native app. 6. How Often Will You Be Updating Your Product? application. If the mobile website has to be edited or upgraded, the changes can be easily incorporated and published. In the case of a mobile application, the process is much more tedious with the updates required to be pushed to the users who have to then download and install it. Besides, different versions of the apps, they to be upgraded for different OS platforms, separately. With a veritable app rush, many entrepreneurs and businesses rush into developing an app. An app may seem to be stylish way to connect to your users, but you should invest in one only after calculating your returns realistically because the development cost of an app is sizable and such expense is pointless if you can achieve your target using a mobile website. Also, multiple versions of the application have to be developed for compatibility with multiple platforms if the application has to be present on the App Stores of all the devices. Development of a mobile website is considerably more efficient in terms of time and money when compared to the development of an application. Moreover, after the initial investment and launch, support and maintenance are much more expensive and time consuming for a mobile application when compared to a mobile website. The app versus website dilemma will intensify as organizations seek to establish a mobile presence in a more and more smartphone-friendly audience base. In this dynamic scenario, it is simply a question of tradeoffs and at the end of the day it is about choosing what is right for your business. The information shared is very helpful! The topic is very relevant to the current needs of enterprises!